For many years now, the risk of a major earthquake in the Kathmandu valley has been at the top of the emergency preparedness agenda of Nepal and the many international organizations that work with them, including HelpAge International. On Saturday April 25, it happened. The confirmed death toll from Saturday’s earthquake has risen quickly to a figure of over 5,000 at this time, with more than 8,000 people injured. Initial estimates say that 8 million people have been affected. These numbers are likely to rise as rubble is cleared and as news comes in from remote and cut-off areas. Aftershocks have been felt with remote villages still to be reached, cut-off by landslides and communications wiped out. This has made rescue and relief work extremely difficult. Thousands are sleeping in the open, as their homes are either destroyed or people are too scared to return to unstable buildings, particularly while aftershocks continue. Terrible though the confirmed fatality numbers are, our duty now is to do all we can to help the survivors. HelpAge has an existing programme in Nepal and well-established local partners in the affected areas. We are also sending a team of experts to support our response. Our initial focus will be to address the immediate needs of survivors including emergency shelter, food, drinking water and household items. The population of Nepal is just over 27 million – with an estimated 2.2 million aged 60 or over. We are looking at the possibility of giving cash transfers to older men and women affected, so that they can buy essentials such as food. We will also work with other agencies to ensure older people are included in their responses. There is strong evidence that older people suffer disproportionately from disasters. They are often not able to flee disasters due to reduced mobility and are also more vulnerable to injury and psychological stress caused by disasters. 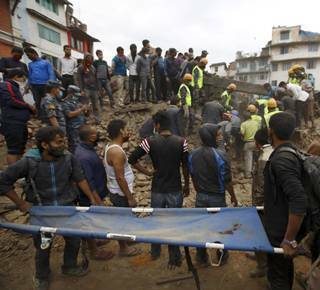 Photo: Rescue workers search for bodies as a stretcher is kept ready after an earthquake hit Nepal.